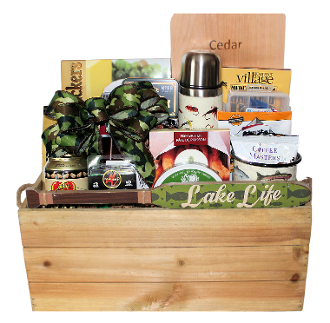 This deluxe fishing gift basket is loaded with gifts and gourmet products. Items include: Fishing Fly Design Thermos, Fish Design Enamel Coffee Mug, Coffee Masters Gourmet Ground Coffee, Three Pepper Water Crackers, Cedar Grilling Plank, Mediterranean Grilling Spice, Fish Design Pocket Knife in Tin Gift Box, Fontazzi Pretzels, Beer Nuts Peanuts, Beer Nuts Cashews, Beer Nuts Almonds, Fishing Oar Wall Decor (style may vary from the product photo), Draft Beer Jelly Belly Gourmet Jelly Beans, Cottage Life Fish Batter Mix, Plastic Mini Lure Box, Swirltail Grubs, Sonoma Jack's Herb & Garlic Cheese Wedges, Beef Jerky and Smoked Oysters. Presented in a wood crate. *Gift and gourmet assortment may vary. 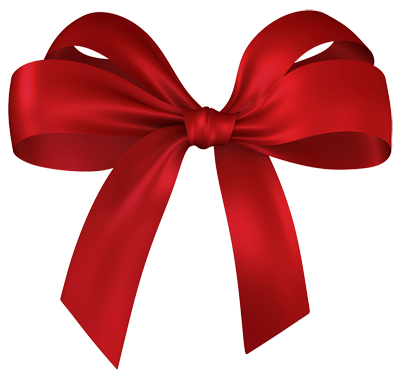 All of our gift baskets are wrapped in cello and decorated prior to shipping or delivery. We also include your personal message on the enclosure card. 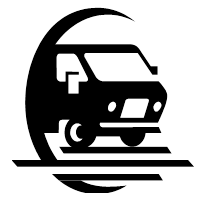 We offer Canada wide shipping and local delivery.